Springfield Glass Company performs dozens of commercial door service repairs every week. While we work on all types of swinging and sliding doors, both manual and automatic, the majority of service calls come in two main areas: the door won’t swing correctly and the lock doesn’t work correctly. Common reasons for those issues are listed below, along with how we can repair them and get your business operating efficiently again. We know it’s tough to carry on if your customers can’t get in the building or if you can’t lock up. At Springfield Glass Company, we have seen every type of door swing problem there is, and worn out hinges are one of the most common. Worn out hinges can keep the door from opening or closing the way it should. They can also cause the door to fall completely out of the frame. The most common commercial door hinge is the offset-pivot type. Usually, these are economically replaceable and we carry most major brands of them for same-day repair. We also carry other types of retrofit hinges to get the entry working again when the door or frame has been damaged too much for a simple pivot hinge replacement. Either way, you’re still in business on the same day. We also offer preventive maintenance and entrance upgrades for hinges to keep simple breakdowns from stopping your business. Damaged door closers also cause lots of problems for entry doors. A door closer is the hydraulic cylinder and arm at the top of the door that helps pull the door closed. These wear out over time and lose their ability to pull the door closed and/or they begin to leak and drip oil—right where your customer is coming through. They are also prone to damage if wind or a person overextends the door. 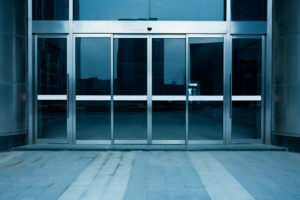 Broken or faulty closers can lead to the door swinging freely and uncontrolled which can be dangerous and cause glass breakage and other costly damage. We carry the typical styles and colors of closers and we can normally replace them the same day, so your customers can get in and out safely and you can close up and go home when you’re ready. Door lock problems happen for many reasons as there are a huge variety of locking systems out there. If the door won’t unlock, that’s obviously bad for business, and if it won’t re-lock, that’s bad for your sleep. We often see problems with deadbolts, panic-exit devices (crash bars), magnetic locks, and electronic locks. The most typical problems are from worn out deadbolt locks or lost keys for deadbolt locks. We can usually fix those the same day. Another common problem is worn out panic-exit devices, due to all the moving parts they have. We can usually get those working again the same day, though we sometimes have to temporarily fix them and order parts to be installed the next day. Often times, locking problems are actually caused by worn out hinges or worn door closers that affect the alignment of the door lock or the closing speed of the door. In those cases, we can resolve the locking issue by getting to the root of the real problem, which can actually be more minor than an actual lock problem. Another common lock issue is needing to change the type of lock on the door—usually from a deadbolt to a panic-exit device or to an electronic access lock. We can provide service options and pricing for those upgrades as well. At Springfield Glass Company, we handle all types of manual and automatic doors and locks. Call Springfield Glass Company today for your door service needs. Give us a call at 417.883.6555 or send us an email at info@spfdglassmo.com.